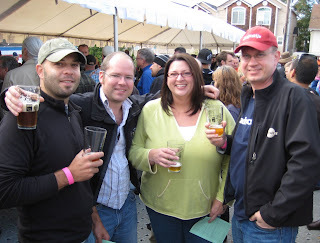 There are a couple other eyewitness reports on Saturday's Fresh Hop festival at Hopworks, so I'm a little late getting my opinion out there. Angelo is really ticked off that most of the taps were dry by the time he arrived at the exact midpoint of the event. The scan of his program with the empty kegs marked is hilarious. The consolation for those who arrived late is the fact that Hopworks rolled out for them the barrel-aged version of their fresh-hop Parsec Pale -- pumped through a filter of fresh hops(! ), as seen in some of John Foyston's excellent photos of the festival. Those of us that arrived on time were told that the barrel-aged Parsec would not be served. All advertised beers were served, at least for a while. Foyston reports that the Portland Deschutes pub is still serving that Fresh Hop Mirror Pond -- and two more fresh-hop ales not at the festival. It's worth checking out. You might find the Ninkasi around town also, it's far better than the fresh-hop light lager they made last year. That was a great little Fest in SE. Besides the beers you mentioned I also enjoyed the Black Flag Imperial Stout from Beer Valley in um, er, of all places Ontario, OR. Love finding new brews from remote outposts like that, very nice indeed. Bryce: I don't think Dave was being handsy, I think he would have fallen down if you and Sharon weren't holding him up. Nevets: Glad you liked the Black Flag; I only had a sip of it but it didn't seem very good to me (nor did the Leafer Madness). I may have to give it another shot. Bryce: If you think that was handsy you should have seen me on the ride home. Bill: Thanks for the ride home, sorry I broke your bike. Dave: For the last few weeks I had premonitions about that wheel breaking. There must have been some structural problem that my third eye could see. And the Citybikes mechanic said that if all it took was an extra person on the bike, then it was about to crack anyway. But next time I will let you walk. Ah, but it looks like a jolly good time. My heart still longs for a day in Beervana! Just sampled the Mirror Pond at Deschutes yesterday - tasty stuff. Not sure if it was the cask-conditioned version or not, but whatever the case, it's definitely one to try. Ben: Yep, that Mirror Pond is good stuff, I tried it again at the pub. Did you try the other two fresh hops at Deschutes? I thought the Goschie's Sterling was OK -- not nearly in the league of the FH Mirror Pond -- but the Mt. Angel Fresh Hop didn't impress me at all. Did not try the Mt. Angel. I had half-pints of the Sterling and then the Cream Ale after a pint of the Mirror Pond. I greatly preferred MP to the Sterling - both in taste and in smoothness.